Since the inception of the Aigantighe Art Gallery in 1956, the Collection has grown to a treasure trove of over 1700 paintings, drawings, and sculptures. With-in this diverse public collection of art there are 13 paintings by the South Canterbury artist William Greene. Greene was described as a “gentle natured, sensitive, shy little man who loved everything and everyone. There was not a bite of vice in his make-up.” (Philip Dovovan 27 August 1968) But despite this image of gentleness, Greene was a giant figure in the development of the arts in South Canterbury at the start of the 20th century. He was beloved by his many pupils for his readiness to help; he was a founding member and supporter of the South Canterbury Art Society; he was well known to many art lovers in the Canterbury region. Greene was born in Australia and immigrated to Dunedin, New Zealand, with this family in 1874 at the age of 2. In 1894 Greene came to Timaru and established his first studio in Bank Street, near the Woollen Factory. In the following year, on 1 October 1896, Greene went into partnership with C.H.T. Sterndale (an artist who settled in Timaru in 1895), and opened an art school and studio in the Royal Arcade on Stafford Street. In 1900 Greene decided to travel to Melbourne to study with the sculptor Charles Richardson (1853-1932). Before departing Timaru, Greene displayed a large number of his works in the local shops and sold 25 paintings. A year later, Greene returned to Timaru, but in 1905 he decided to travel again - this time to London to study at the Calderons School of Animal Painting in Kensington under Briton Riviere (1840-1920) and Sir Alfred East (1844-1913). While traveling in Europe Greene met Katrine Josefine Walchter (1882-1957) - a Hungarian artist who he later married in London. In 1912 Greene took up a part time teaching position at Timaru Boys’ High School and a position at the Timaru Technical College. Then in 1921 he moved to Christchurch and took up a position at the Christchurch Teacher’s Training College. But before leaving Timaru (as a founding member and for his dedication to the arts in the region)he was made a life member of the South Canterbury Art Society. Greene died in Christchurch at the age of 53. Greene was a humble man who loved to paint the sublime beauty of animals and the simple rural landscapes that surrounded him. Echoing some of these contemporaries , such as Sir Edwin Henry Landseer (1802 – 1873) and the painters of the French Realism movement of the mid-19th-century including Jean-François Millet and Gustave Courbet, who painted ordinary people and the ordinary surroundings of everyday, trying to capture a world before it is destroyed by the industrial revolution. Russell Stuart Cedric Clark (1905–1966) was a man of many talents; a commercial artist, illustrator, painter, sculptor and university lecturer. Born in Christchurch on 27 August 1905, Russell Clark was the son of Mary Elizabeth Wyatt and her husband, William Clark, a plumber and tinsmith. At an early age Clark showed an interest in art, and was encouraged by his family to attend art school. From 1922 to 1927, Clark attended the Canterbury College School of Art. During this time he was taught by Leonard Booth, Richard Wallwork, Cecil Kelly, and Archibald Nicoll. Out of necessity Clark left art school in 1928 to work as a commercial artist for the Jewell–Skinner Advertising Agency. The following year he moved to Dunedin to take up a position as an illustrator for the printer and publisher John McIndoe. In 1932, he started evening and Saturday morning art classes at McIndoe’s design studio, which became popular with many younger Dunedin artists, including Doris Lusk and Colin McCahon. After nine years in Dunedin Clark became uneasy and in 1938 moved to Wellington to work for the advertising agency Catts–Patterson. Then in 1941 he joined another Wellington advertising agency, Carlton–Carruthers. During his time in Wellington Clark became the principal illustrator for the New Zealand School Journal and The New Zealand Listener. It was through these two publications Clark became part of New Zealander’s everyday lives and became familiar to generations of school children for over twenty years. With the outbreak of World War II Clark wanted to contribute to the war effort as a war artist and in 1942 approached the prime minister, Peter Fraser, offering his services. But it wasn’t until 1944 he was appointed Pacific War Artist by the New Zealand government. Clark was assigned to the 3rd New Zealand Division based mainly in the Solomon Islands. Over nine months he produced hundreds of sketches and painting of operations in the Pacific. Many of these sketches were later worked up into finished works in his Wellington studio. When he returned to advertising in 1946, he was in his own words ‘unable to take it seriously’. Fortunately, he was successful in obtaining a teaching position at the Canterbury University College School of Art, which held until this death in 1966. The 1950s was perhaps Clark’s most productive and experimental period with a focus on the distinctively New Zealand way of life. In particular a visit to Te Urewera in the central North Island for the School Journal provided new stimulus. His treatment of Maori in illustrations, painting and sculpture during this time had a naturalism that had rarely been achieved in New Zealand. By the late 1950s, sculpture became Clark’s main focus and he was immersed in a series of large scale public sculptures. 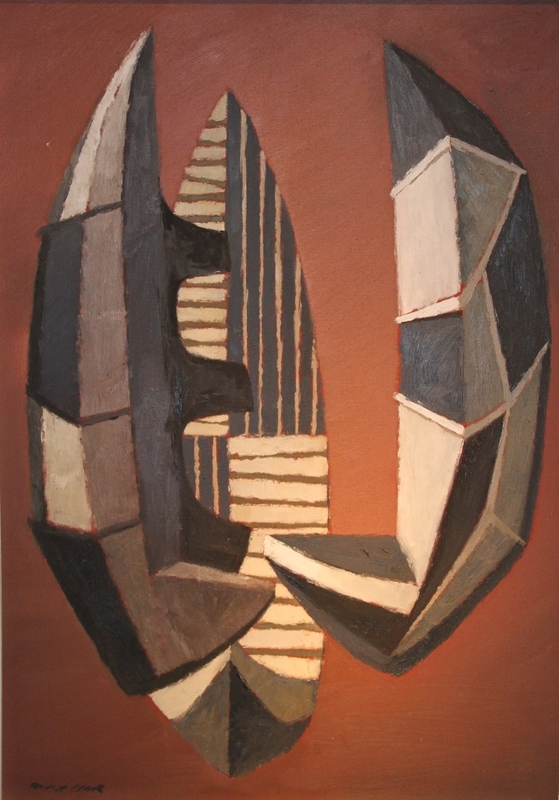 Among his noted public commissions were sculpture murals for the Timaru Telephone Exchange (1957) and the Christchurch International Airport (1959). These were heavily influenced by British sculptors Barbara Hepworth, Henry Moore and Lynn Chadwick. Clark believed public sculpture was vital. He stated “it is important that the public should become used to outdoor sculpture and to accept it as they would any other seriously conceived decorative work”. He thought a small percentage of building costs should be allocated to public sculpture so cities can lose their “cultural starvation”. Clark dedicated his life to art and became a force in New Zealand art in the middle of the twentieth century with unique images of New Zealand life and introduced modern public sculpture, changing attitudes toward art in public places. Since the South Canterbury Art Society was founded in 1895, the Society activity set about collecting art works by national and international artists to support its aim to promote the study, practice and enjoyment of the arts. 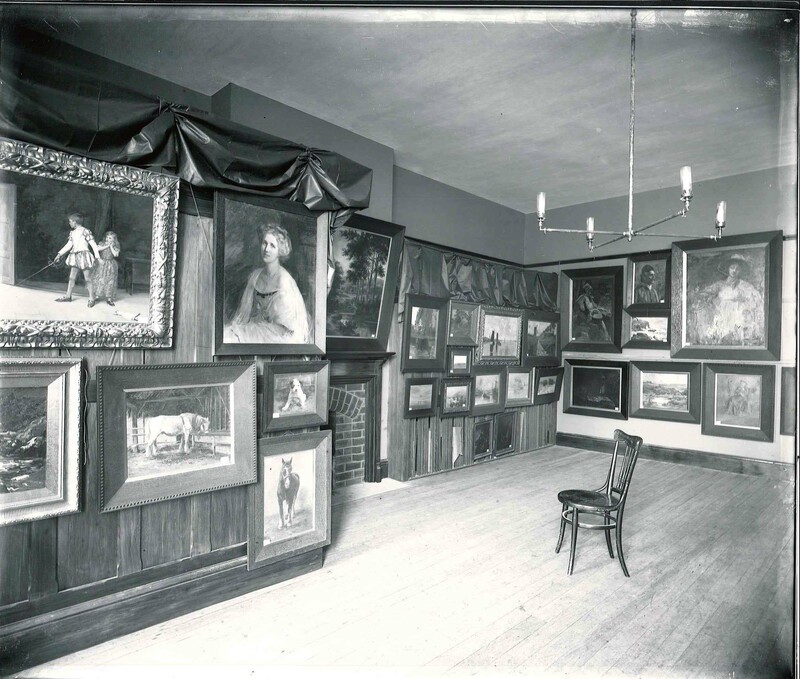 By the 1950‘s the Society had a collection of over 50 works, which was generously gifted to the Aigantighe Art Gallery and the people of Timaru in 1956. One of the paintings the Society purchased in 1910, and later gifted to the Aigantighe Art Gallery, was an oil painting by English artist Charles Collins (1851-1921), entitled Wick House, Dorking. Alfred Charles Jerome Collins was born in Hampstead in 1851. 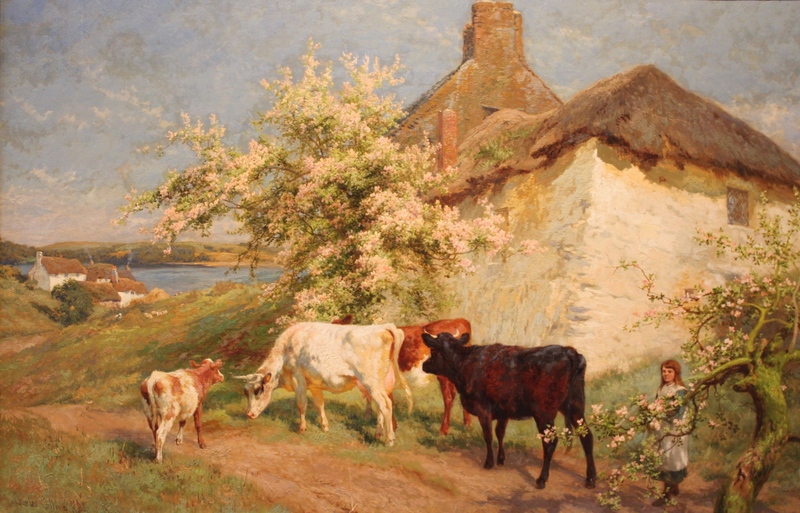 Encouraged by his father, who was also an artist, Collins began painting at a very early age, painting mainly picturesque landscapes with cattle and figures. He later studied at the West London School of Art. In 1876 he married Georgiana Waddingham and had nine children - who Charles often included in his paintings. Collins was a prolific artist and exhibited regularly at the Royal Academy of Arts, in Burlington House, London from 1867 to 1903. He also exhibited at the Royal Society of British Artists, which was established in 1823, and at the Royal Watercolour Society. For many years he illustrated books and produced postcards for the well-known publisher Ernest Nister (1841-1906). He also held the post of Art Master at Dorking High School for many years. He died in September 1921, after being knocked down in Vincent Lane, Dorking. 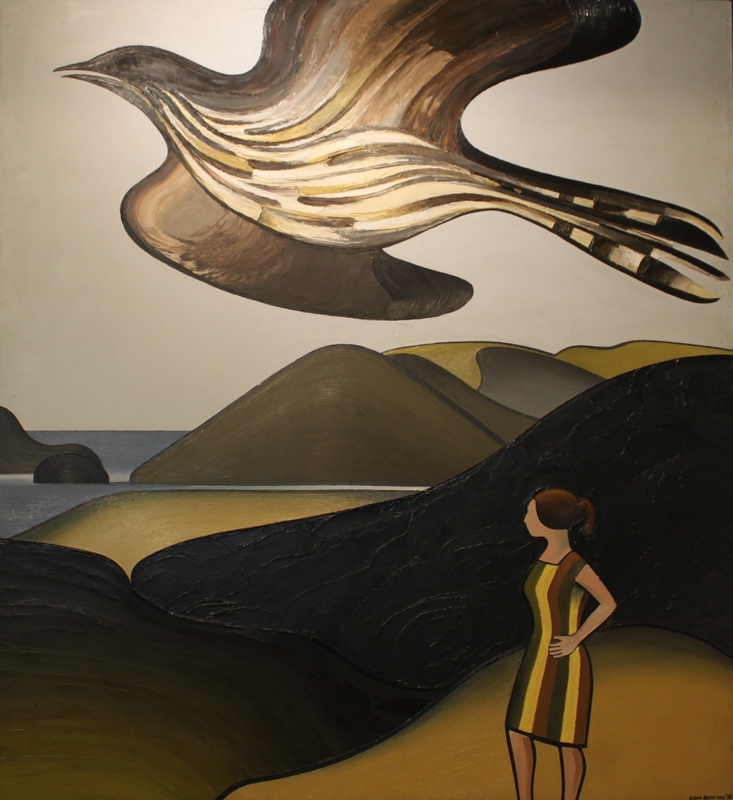 Don Binney’s paintings are amongst the most instantly recognisable and iconic images in New Zealand art, with their fluid forms, sense of space, and depictions of native birds and the unique New Zealand landscape. Binney was born in Auckland in 1940, and was the nephew of prominent architect Roy Binney. He grew up in Parnell. From 1958-1961 Binney studied at Elam School of Fine Arts in Auckland, and gained a Diploma of Fine Arts. Binney’s tutors included Ida Eisa, James Turkington, Robert Ellis and Robin Wood. In 1963, he held his first solo exhibition in Auckland at the Ikon Gallery, and then began teaching at Mount Roskill Grammar School. In 1967 he was the recipient of a Queen Elizabeth II Arts Council travel fellowship. He spent time in Mexico, London and Australia before returning to New Zealand becoming the senior lecturer in painting at Elam School of Fine Arts from 1979 to 1998. Binney was awarded an OBE for services to the arts in the 1995 Queen's Birthday Honours and is represented in art collections around New Zealand.